the attitude of natural mayflies as they drift downstream. 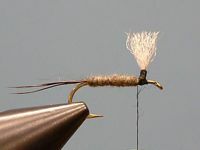 The wing post around which the hackle is wound can be made of some highly visible color, making them easier for us middle-aged types to spot on the water. They are far more likely than their collar-hackled cousins to land in the correct upright position on the water when they are cast. Finally, because the hackle doesn’t actually float the fly, they don’t have to be tied with the most expensive genetic dry fly hackle to work properly. Effective, user-friendly, and cost-efficient—a no-brainer, right? Well, yes…once they’re tied. Getting to that point can present a problem for some fly tiers. 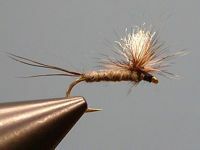 The tail and body of the fly don’t present that much difficulty, as they are identical in their proportions and construction to those found on a traditional collar-hackled dry fly. It’s the creation of the wing post that serves as the base for the parachute hackle that seems to intimidate a lot of tiers. There is a way to do this, however that is not only quite easy, but that substantially improves the performance of the fly, and it all has to do with materials. waterproof and therefore adds floatation to the fly, and, because its fibers allow air to pass through them easily, it is less likely to resist the wind, causing the fly to spin and twist the leader during false casting. It can also be mounted in a way that adds virtually no bulk to the body of the fly, allowing for a trimmer, more natural-looking finished product. Cut off a hank of winging material about 1 ½ -2 inches long and tie it in at its middle point on top of the hook shank. Once it’s secured, let the thread hang and grab the two ends of the hank of yarn, and tug them out to the sides of the hook shank, as if you were trying to fashion the spent wings of a mayfly spinner. Take up the thread again and make a few “figure-8” or “X” wraps over the tie in point, securing the yarn in this position. Now drop the thread again and this time tug the two ends straight up over the top of the hook shank. Hold them there with one hand while you take 4-6 turns of thread around the yarn only—not the hook shank! This will bind the two ends of the hank of yarn into a solid wing post, and it will provide a solid base around which to wind the parachute hackle later. Trim the post to the desired length. With the wing thus in place, you can create the rest of the fly as desired. The parachute hackle mounts just behind the wing post and is wound around it rather than the hook shank. The hackle can be tied off either just in front of the wing post on the shank or on the wing post itself. By the way, informal research has shown me that the fish don’t much mind what color the wing post is—it’s more the silhouette they’re interested in. I have tied posts in blaze orange, hot pink, and screaming chartreuse and caught good fish on all of them. A black post is a great help on gloomy, overcast days, as well. Once you’ve mastered parachute wings with synthetics, you can transfer your skills to the world of natural winging materials. Until then, this technique will get you on the water with these highly versatile and extremely effective patterns.